While southern California has Disneyland in Anaheim (see Orange County Amusement Parks) and Universal Studios in Hollywood (see Los Angeles Amusement Parks) — plus Legoland and Sea World near San Diego (see San Diego Amusement Parks) — northern California’s theme park offerings include Paramount’s Great America in Silicon Valley and Bonfante Gardens in Gilroy. Some of the state’s lesser known theme parks are Castle Park in Riverside, Nut Tree Family Park in Vacaville (between San Francisco and Sacramento), and Trees of Mystery in the Redwood National Forest near the state’s northern border. Not surprisingly, one of the most popular “themes” for California amusement parks is water, and you might also want to consider visiting one of the state’s many waterparks. 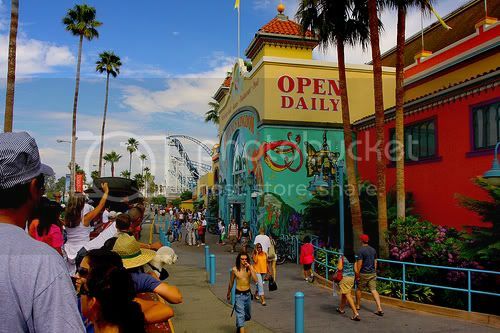 Knott’s Soak City USA has locations in San Diego, Palm Springs and Orange County, Waterworld USA has parks in Concord and Sacramento, and Raging Waters can be found in Sacramento, San Jose and San Dimas. There’s also Six Flags Hurricane Harbor in Los Angeles (near the Six Flags Magic Mountain amusement park) and The Island Waterpark in Fresno. Are you a “kill two birds with one stone” sort of traveler? Well, then, why not combine an amusement park visit with a trip to the one of our many fantastic California beaches? This can be accomplished at Belmont Park in San Diego’s Mission Bay area, Pacific Park on the Santa Monica Pier, the Balboa Fun Zone in Newport Beach, the Santa Cruz Beach Boardwalk or at Pier 39 in San Francisco. Photo of Santa Cruz Boardwalk by the_tahoe_guy (deleted account) via flickr (Creative Commons).